Conn ap Llyr is the prince of the Selkies, children of the sea with supernatural powers. Conn’s people are dying. They have not had children in a long time, and they are under attack from the children of fire, demons that come from under the earth, who are surreptitiously trying to destroy their civilisation. Conn believes that the key to saving them lies in a prophecy that claims that the daughter of one of their witches Atargatis would have enough power to defeat the demons and bring their civilisation back from the brink of extinction. Lucy Hunter is the daughter of the selkie Atargatis and a human. Her father fell in love with her mother and took away her pelt, without which she is unable to transform and return to the sea in her selkie form (that of a seal). They had three children, of which Lucy was the youngest, until one day she found her pelt and returned to the sea with Lucy’s middle brother, Dylan (see Sea Fever, the book before this one). Lucy is afraid of the water, but at the same time cannot be too far away from it without knowing why. She was raised by her eldest brother, Caleb (see Sea Witch, the first book in this series), and neither of them knew of their mother’s heritage. Lucy is kept sheltered from this heritage, regardless of what both her brothers know by this time in the series. Conn comes to World’s End, the island off the coast of Maine where Lucy lives, ostensibly to see Dylan, but really also to check out the potential for the fulfilment of the prophecy—whether it is through her or her brothers. Conn is captivated by Lucy and can’t explain why. He sweeps Lucy off her feet and, through a bit of trickery, manages to take her back to his island home. There, he goes about trying to convince her to help him save his people, while at the same time dealing with the Children of Fire, who have come to his island supposedly to broker a treaty between their races. While this is part of a series you don’t have to read the whole thing to enjoy this book. Virginia Kantra provides a short and sweet intro, and a lot of things can be inferred or learnt just as Lucy is learning them, as she has no background of what is going on either, family-wise. Lucy comes into her own in this novel, and it’s as much about her finding herself and who she is as it is about finding love and defeating evil demons. The demons, while they’re part of the story, are not the main focus, and I like how Kantra makes use of them to enhance the story without eclipsing the romance. The supernatural elements are well integrated, and I find Kantra’s use of the selkie mythology to be unique among most of the paranormal novels I have read. Conn and Lucy’s growth as a couple is sweet. Conn tries to introduce her into his world and she stubbornly— and logically so—refuses at first. The progression of their relationship proceeds at the appropriate pace. Along the way, Lucy discovers that she has certain powers, and this adds to the complications she is facing as a character, and as a part of their relationship. This enhances the story, and I felt that this development started out well, but her sudden ultra powerfulness was a bit convenient—like oops, this being is hurt—I suddenly have the power to heal, this demon is attacking me—I suddenly have the power to extinguish it. Wow, Lucy, you’re a goddess. Other than that, I think that Lucy’s growth as a character is enhanced by the self-empowerment her powers bring. I think that this book is especially good for people who like paranormals but are over the usual fare. Every other book I have read has the typical paranormal element in it—vampires, demons, etc.—and sometimes you get a hit or a miss. I liked this series because it was different, and even if there are demons in it and they’re still the bad guys they are not as central to the story as the love story is. While the story is probably more of the same—boy + girl with supernatural powers kinda need to save their world—Kantra puts a fresh spin with the use of mythology and character growth in both the hero and the heroine. In the end we all know they will save the day, but it doesn’t deter from enjoying the flow of the story. Despite not having read the first book, I think I can safely recommend this series to everyone. I enjoyed 2 out of 3 and will most likely get the first book when I get the chance (my local paranormal bookstore does not sell Kantra—hello, Galaxy, are you reading this?) and that’s a good enough record for me. It also helps that they can stand alone, so you can pick which hero you want to read about, and then decide if you want the rest. (So far Sea Fever is my favourite of the 2.) I quite liked this series and I’m hoping she writes more books set in this world. 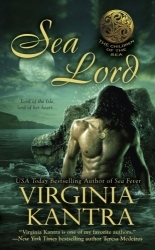 Tagged celtic mythology, children of the sea, shapeshifters, virginia kantra. This one has been on my hold list with the library. Can’t wait to get it! I’ve had the second book in my TBR pile for a while. I really should get to it soon.